Our live and online Militaria auction in January is truly a remarkable one, including treasures from as early as the 1600's, to an unparalleled collection of wings and aviation badges and medals from all over the world. 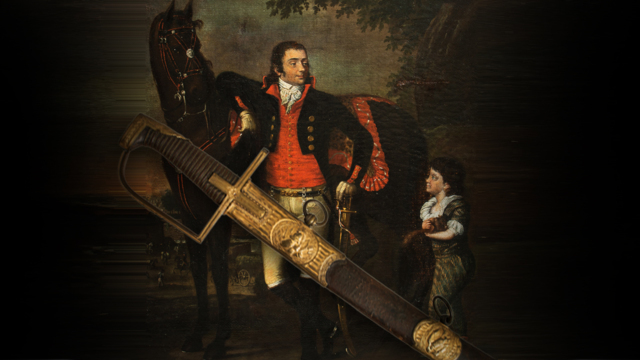 We have a superb portrait and saber of a French Revolutionary officer, a military letter signed by Alexander Hamilton, and a spectacular array of swords, and guns that range from a rare Italian made Arab Jezail, to a selection of very rare Arisaka rifle variants. For 3rd Reich collectors we have a collection of veteran brought-back daggers, and for World War II collectors we have more items from the estate of General Anthony McAuliffe. There are too many treasures to mention them all, so make sure to attend our preview! This is a world class sale, with many items of exceptional rarity and historical significance. This will be a live and online auction, so come join the fun.